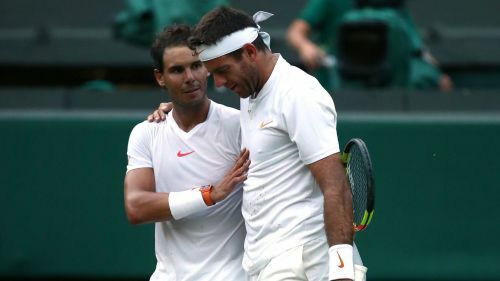 Rafael Nadal knows he will have to be at his best to beat a rejuvenated Novak Djokovic after coming through an epic Wimbledon quarter-final against Juan Martin del Potro. The world number one had to draw on all his mental strength, stamina and talent to see off the magnificent Del Potro 7-5 6-7 (7-9) 4-6 6-4 6-4 on Centre Court. Nadal and Djokovic have met 51 times in their illustrious careers, the Serbian having the edge over his rival with 26 victories, though he has lost their last two encounters, both on clay. The Spaniard – seeded second at SW19 this year - is braced for another huge test on Friday as he eyes a third Wimbledon triumph, with favourite Roger Federer having suffered a sensational defeat to Kevin Anderson in the last eight. Nadal said: "There is no other match in the history of tennis that has been played more than our matches. That's a big thing. We always played in important stages, important places. "Friday is another important match against an opponent who is one of the most difficult ones that you can face. He's playing well. The only way to try to win it is play very well. "It is always a big challenge to face Novak. He is one of the more complex players that I have ever seen in our sport, it is always a big test. You know that you can't win against him if you don't play very well. "But my goal is to try to play very well. I know in the semi-finals of Wimbledon you will not have an easy opponent. You have to accept that if you want to win important things. Of course you will face the best players. You need to be ready for it." Nadal was on court for nearly five hours against Del Potro and admitted afterwards he knew the duo had been involved in something special. "I am very happy with the way that I survived a lot of important points in that fifth set. I think I did a lot of things well. I went to the net. In general terms, it has been a positive match. The only negative thing is I played almost five hours, and I had the chance maybe to play less winning that second set." he said. "For the rest of the things, great news, semi-finals of Wimbledon again. Great match, emotional match for both of us and for the fans, too. Great feelings." Australian Open 2019: 18th for Nadal or 15th for Djokovic? Australian Open 2019, men's final: It's Nadal vs Djokovic again!